Here you can find all info about AK-47 from Sensation Seeds. 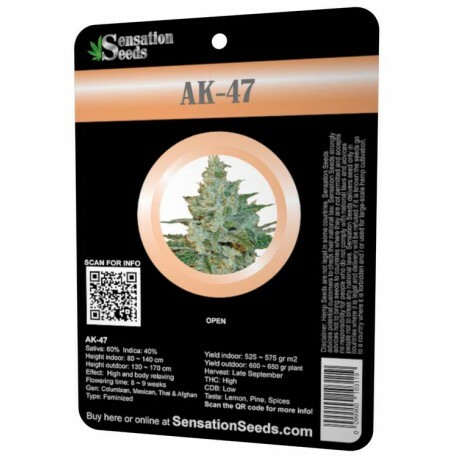 If you are searching for information about AK-47 from Sensation Seeds, check out our Basic Infos, Shop-Finder and Price Comparison or Lineage / Genealogy for this cannabis variety here at this page and follow the links to get even more information - or list all AK-47 Strains (±14) to find a different version. If you have any personal experiences with growing or consuming this cannabis variety, please use the upload links to add them to the database! 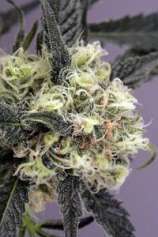 AK-47 is a mostly sativa variety from Sensation Seeds and can be cultivated indoors (where the plants will need a flowering time of ±60 days) and outdoors. 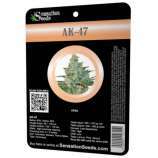 Sensation Seeds' AK-47 is/was only available as feminized seeds. Where to buy AK-47 cannabis seeds? AK-47 from Sensation Seeds is available only as feminized seeds. Regular seeds are not available at the moment. We found 1 offer for USD 34.52 for 5 feminized seeds. 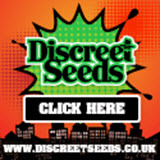 If you are looking to buy AK-47 Cannabis Seeds from Sensation Seeds somewhere - have a look to our AK-47 Price Comparison page with all current offers from all the connected seedbanks and shops - or visit one of the following tested, trustworthy and recommended seed-shops directly to check out their current AK-47 offers: Zamnesia. Do you know something more about Sensation Seeds' AK-47? Please help to make this database better and upload/connect your information here!